Crewneck Sweatshirt is in stock. We will print it as soon as you order it. This classic has stood the test of time. 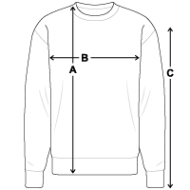 Always in fashion, this crewneck sweatshirt by Gildan is perfect as an outer, under or single layer. Soft and comfortable, this stand-by is a must. My review is related more to the stamping of the product which seems cheap or it will not last after a few washes. If I were the business school I would not allow putting its brand on the sweatshirt. Fits great! The printing was just as I had asked, this purple color is fantastic, the picture doesn't do it justice. Loving my sweatshirt. Look forward to my next order. The shirt fits very well, the printing was just as I asked and the fabric seems a little softer than most. Look forward to my next order.